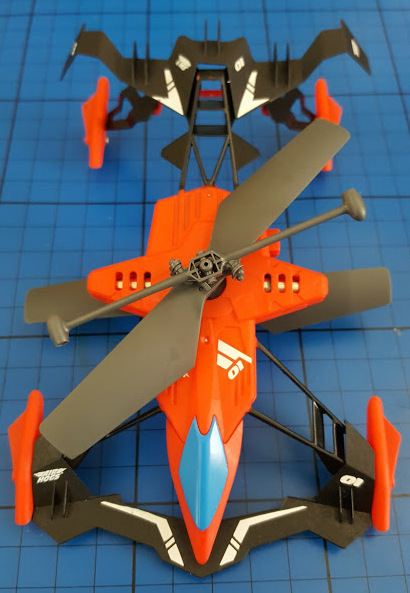 The Brick Castle: AirHogs Switchblade Review (from Spinmaster Toys). 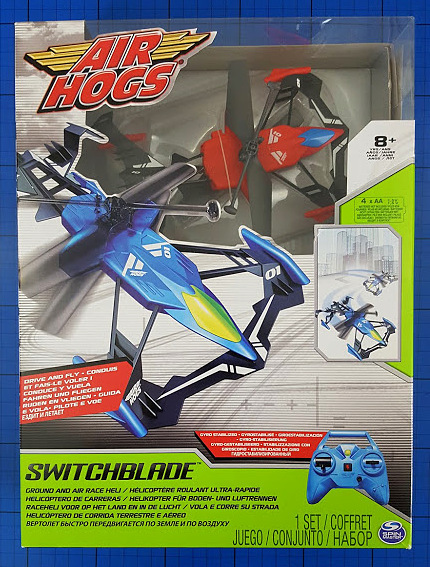 AirHogs Switchblade Review (from Spinmaster Toys). 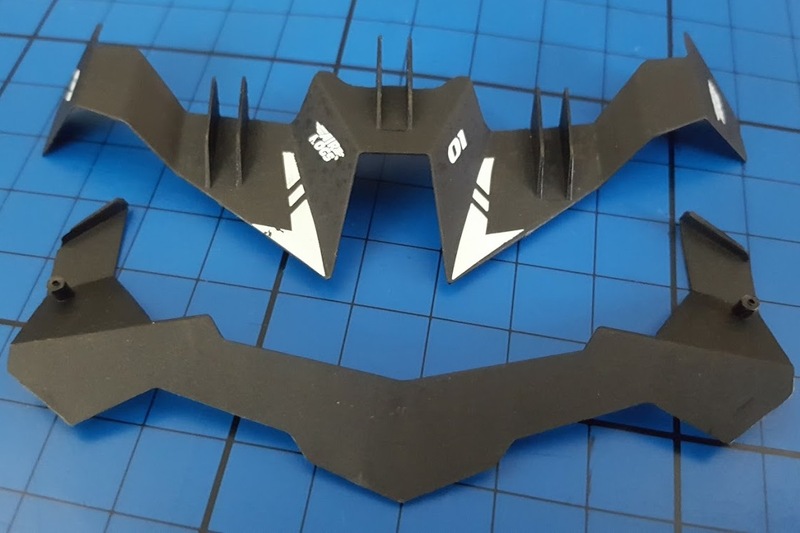 The AirHogs Switchblade is very different to most of the remote control vehicles we've had here in the past. An indoor ground and air race helicopter, it's incredibly small for starters, a mere 16cm x 11cm without the spoilers and weighing under 30grams. It doesn't half have a lot of power though. 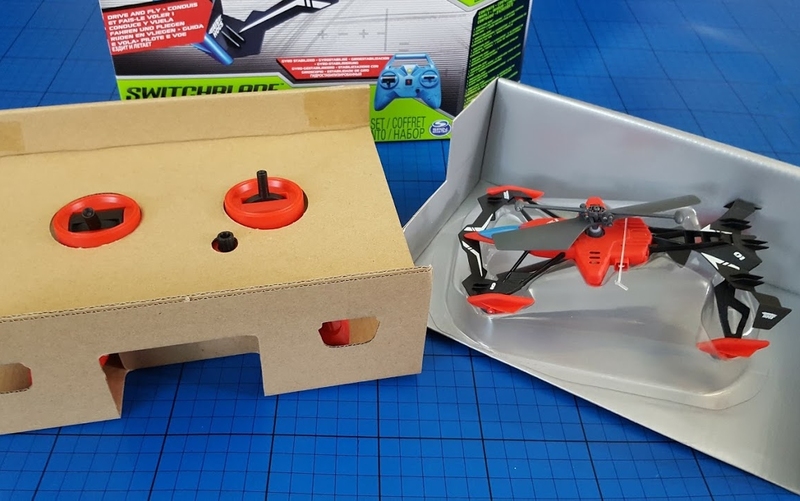 Inside the box you have the vehicle and the controller - it takes 2 minutes to open and packaging is really minimal. Perfect for Christmas morning...don't forget the batteries though - the controller takes 4 x AA batteries. 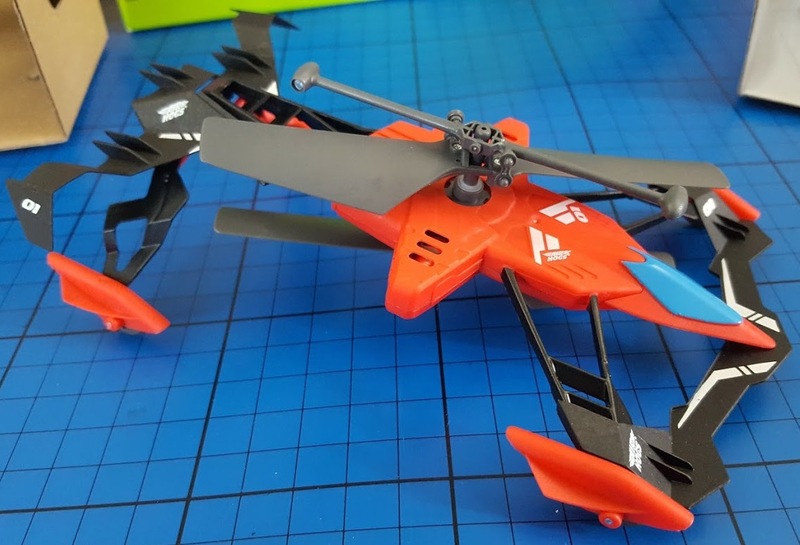 The AirHogs Switchblade Helicopter is recharged via the controller, either directly, or using usb. It's quite a complex system, but it works well and charges in the vehicle about 10 minutes. Each charge lasts for a lot longer than you'd expect. We've read 4 minutes, but I'd say it's more. 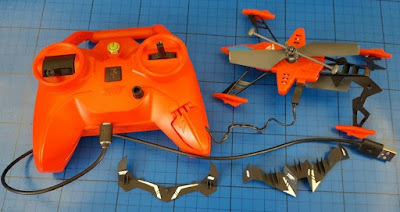 We haven't yet run out of battery power for the controller, but have always charged the heli using the usb connected. Both the Switchblade and the controller have on/off switches to preserve battery life. 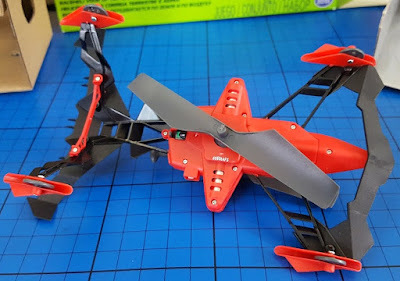 It has a really tiny frame, but the Switchblade is surprisingly strong, and despite several quite fabulous crashes, ours has yet to come to any harm. Impressive, and as good as the claims. I honestly didn't expect it to last so well as it looks so delicate. The control system is labelled Intermediate and is quite tricky to master. For ground control with the spoilers in place on the vehicle, the controls are intuitive and work naturally, but flying is obviously harder. To raise the Switchblade you push 'forward' to the maximum and then back off immediately your helicopter is in the air. It's counter-intuitive to start at full throttle, and you have to drop the power quickly, so anyone using the helicopter is likely to struggle at first. Your AirHog has Gyro-stabilization to give a smooth, easy-to-operate flight (and an anti-spin adjuster on the controller). You can tell it's smooth, and the Air Hog stays perfectly upright throughout, but direction will take a bit of practise and we have not mastered landing at all. It's definitely not falling with style. The AirHog is designed to be safe, despite the electricity involved. It has an anti-short charge plug and overcharge protection, plus no exposed wires or gears. When the AirHog is flying it'll sting if it hits, but it won't do any serious damage to your child. Do be careful to always keep hair well away from any rotating parts though. I think my 8 year old probably has as much chance of mastering the Switchblade as I do, but I have a head start on him right now. 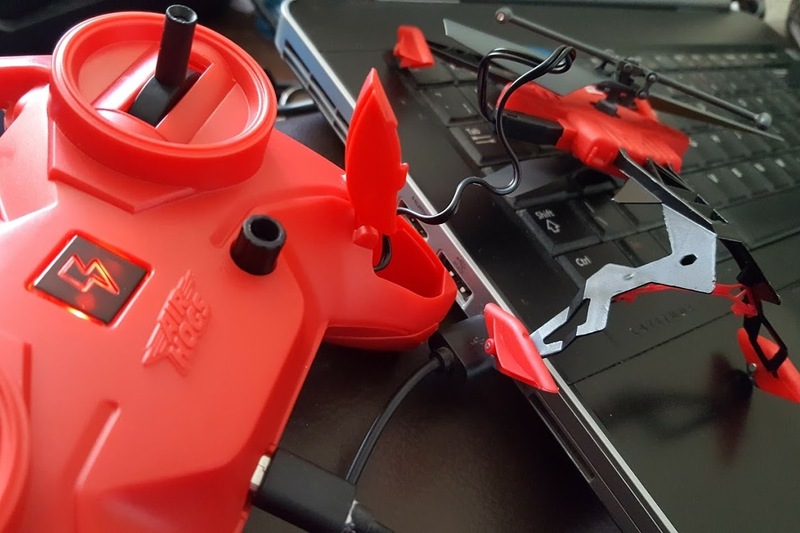 Although flying is tricky, the fact you can play on land too means you can practise the controls at a far easier level, and your child is less likely to let the AirHog sit in a box because 'it's too hard'. AirHogs Switchblade is distributed by Spinmaster Toys. Available to buy now in your choice of Red or Blue rrp £49.99 from all good toy shops instore or online, including Amazon, with a recommended age suitability of 8+.